Have you’ve been involved with a No Spend Challenge? Or maybe you’ve considered joining one in an attempt to gain control over your personal spending habits and finances in general? On face value, these spending zero challenges sound like a great idea. I mean, if you could go 30 days not spending money, and have most of your spending problems solved, wouldn’t that be great? Most of the No Spend Challenges I’ve downloaded and looked at will certainly get your mind distracted and away from looking at your money. Most of them have you cleaning and organizing for most of the 30 days. I guess if you’re so consumed with cleaning everything from the kitchen pantry to your bathroom shelves, maybe they figure you’ll be too exhausted to bother to shop. If nothing else, your house will be sparkling clean and clutter free; and that’s a good thing. But these challenges should be called 30 Days of Distractions, So You Don’t Have Time To Go Shopping. That’s not to say that some people don’t benefit from the challenge – I’m sure some do. For some, it serves as a wake-up call. For others, they begin to develop some different habits. But for the majority of people who have a serious problem with overspending, a No Spend Challenge won’t do much for them and here’s why. Raise your hand if you enjoy fasting? Don’t you just love all the hours that go by you’re not allowed to eat not only your favorite foods but any food at all? Did you lose weight after your fast? Probably. Did you keep it off after you fasted and starved yourself? As a person who has dieted a lot, I can tell you restricting anything is never the way to change behavior. My problem with food, just like my problem with money has always been rooted in my inability to control myself, as a tool to meet my unmet needs, and as a way to feel better about crummy life circumstances. If you haven’t determined what triggers your out of control spending, what unmet need is not being fulfilled and found an alternative to meet that need, a 30 Day Zero Spending Challenge won’t help figure that out. In the end, you’ll end up feeling deprived and will more than likely revert right back to overspending. Well let me see here, the whole point of budgeting or developing a spending plan is so you don’t spend money on things you don’t need. So just go back to your spending plan. Depriving yourself for too long will only trigger that need to be impulsive or to fill the unmet need with shopping. Why test yourself that way? Why would you want to purposefully put yourself in a position where you have your back up against the wall? Tracking your spending is another tool. Using these every day is what’s going to make the long-term permanent changes to your spending habits, not some arbitrary zero spending challenge. We are all human going through this debt free journey doing the best we can. Some of us have made it to the other side only to find ourselves in debt again. Some have come through and remained debt free for years. Some of us are just starting out. The reality is no one is perfect. I still find myself struggling from time to time with my spending plan. Sometimes I feel stressed or overwhelmed, and I know a good pair of shoes or a beautiful new pocketbook will lift my spirits. Today, the only difference when I feel this way is I pay cash for the purchase. But the underlying issue is still there. I’ve got an unmet need I’m filling with shopping. Sometimes I take the item back when I see the error of my ways and sometimes I don’t. I wallow in my self-pity long enough to make myself feel better, and then I dust myself off and get back on track. Over the years these episodes are significantly reduced because I’ve done the work and continue to do the work of determining why I feel the need to be impulsive and spend money. In the moment I get to think, dissect and make choices which bring me to my next point. If you’re in one of these zero spending challenges your being forced to put off the decision-making for a later time. But what I know for sure is how powerful decision making is when it’s done in the moment, when you’re staring down the barrel of the spending gun. That’s when you get to be your most powerful because you get to decide what you’re going to do. Are you going to stick to your spending plan or are you going to let your emotions get the best of you? And, even if you decide to let your emotions determine your spending, you’ll still have an immediate reaction when you fork over the money or credit card to pay for the item. You’ll know, if you’re doing the work, you’ve made a mistake and you’ll get to choose again. Choice affords us the opportunity to learn and grow. Take away choice and you lose the chance to learn from your mistakes and achievements. 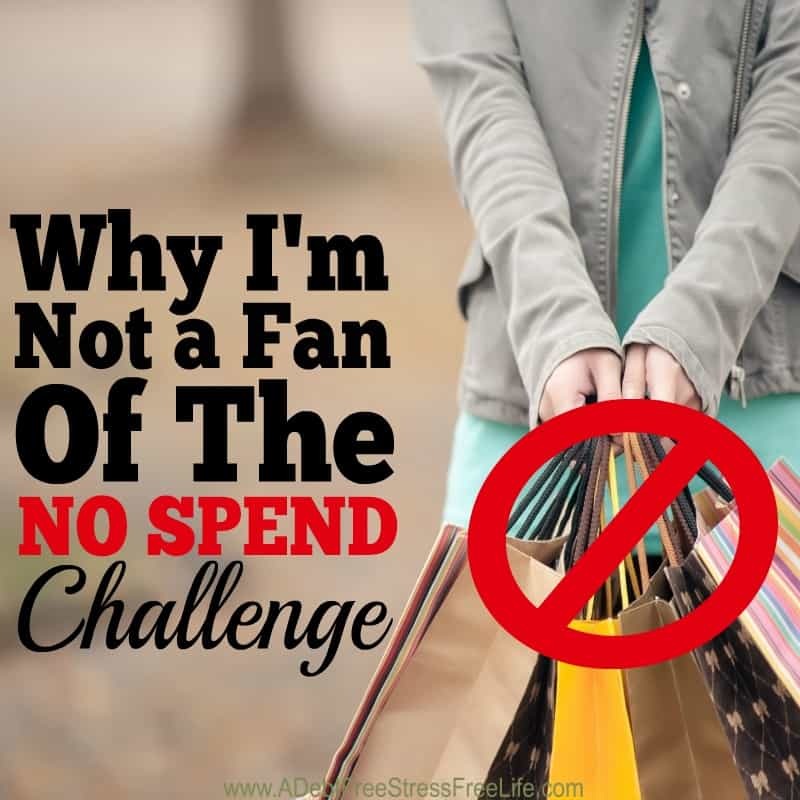 In almost every no spend challenge I’ve ever looked at they offer the reader some alternatives to curb the desire to spend money but provides the psychological boost. They come at the time in the challenge when you’ll be chomping at the bit to spend money. In essence, these ideas do nothing to help you evaluate your real issues because it just feeds into your desire to go out and get something – anything. I remember when I started extreme couponing. I got such a high getting tons of free toilet paper. I would fill my cart and grin from ear to ear as I checked out owing nothing. I was on cloud nine and felt superior to all the little minions out there who were paying full price. I was substituting getting free stuff for addressing the real issues in my life. Extreme couponing had replaced overshopping and impulse buying. I decided then and there that while I did enjoy getting a bargain, I would never buy anything with coupons unless I personally had a need for the item. I no longer sought after everything and anything that was being offered up for free. If it wasn’t something my family needed, I took a pass. Today I don’t even use coupons because frankly, I don’t have the time. If you start searching out free stuff, how on earth is this helping the underlying issues for why you overshop and spend compulsively? It doesn’t. So you’re at day 24 of your zero spending challenge, and you’re feeling desperate. What you want can’t be found for free, so you’re going to revert to bartering. To get what you want, you post what you’re willing to give in exchange and pray for some takers. Here’s the problem: often the exchange is not an even exchange and people feel taken advantage of, especially if they do this regularly. Second, once again you’re forcing yourself into denial mode only to now find yourself desperate from the relief of this self-imposed restriction. You’re learning nothing by doing this; at least nothing of any real importance to your finances. I had to chuckle at what one of the zero spending challenge folks used as a bartering example. She offered up some pretty nice services: a family photo shoot, a home-made cake or a home-made dress for a little girl. What was she looking for? Beer and babysitting! Now did she really NEED beer and babysitting? Of course not. But she really did WANT it and therein lies the problem with using this as a tool in a zero spending challenge. She wasn’t getting what she wanted and that was all that mattered. Once the spending freeze is over she’ll just go back to buying what she wants when she wants it. Most debt is created because people want what they want. People will always find a way to get what they want, but they won’t always put in the same effort in finding a way to get what they need. I know the internet is full of people offering you the chance to do a No Spend Challenge, and some of these people I respect greatly. I know you might be tempted to try it, but I encourage you to take a pass. Instead, sit down and start tracking your spending, develop your monthly spending plan and start using the tried and true methodologies that will help you gain control over finances and put you back into the driver’s seat of your money. We all want that magic bullet to help get out of debt. But the hard cold truth is getting out of debt, changing your relationship with money, and filling the void you have inside without shopping takes work – more work than a 3o Day No Spend Challenge can offer.